"I look at life as if you're in a speedboat going across a beautiful, clear lake," says former Eagles guitarist Don Felder. "You can try to throw as much garbage out of the boat as you can. What happens is, you finally get to the beach and you set up your umbrella, your blanket and your ice chest, and all that garbage washes up at your feet sooner or later. The more good things you can leave in your wake, the better off you'll be." Felder speaks in a vaguely beatific tone, but as he points out, his current tranquility is the result of coming to terms with years of turbulence, both personal and professional, that culminated, in 2001, in a divorce from his wife of 29 years and his contentious exit from the Eagles that same year. "It was... a difficult time," he says, letting out an ironic laugh that more than underscores the magnitude of those events. 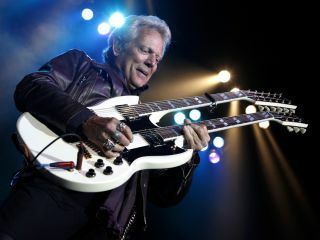 Known for his graceful, yet wildly idiosyncratic guitar playing and for composing the music to a certain quintessential rock anthem known as Hotel California (the outro's soaring, latticework of leads are considered considered de rigueur for axe enthusiasts of all stripes), Felder's solo output has been intermittent to the point of barely there: His new album, Road To Forever, is his second such effort and it follows Airborne by nearly 30 years. But the new disc is well worth the wait. The album's 12 cuts are heartfelt and direct, a catchy and soulful musical autobiography that steers clear of mawkish self-indulgence. And Felder's guitar playing - rendered with but a fraction of his nearly 300 instruments! - is as stirring as ever. In the following interview with MusicRadar, Felder talks about the making of Road To Forever, reflects on his post-Eagles years and recalls how he learned to play slide guitar from none other than Duane Allman. OK, so here's the obvious question: Why the 29-year-gap between solo albums? "First of all, the Eagles consume literally 364 days out of the year when you're in that organization. I have four kids - I had them when I was in the band, during the '70s - and for the first 10 years of their lives, I was an absentee father. So when I did my first solo record in 1983, I decided not to go out on the road 'cause I didn't want to abandon my kids again. I had been gone for so long, and it was time for me to invest some time and energy with my family. "I put out the record, didn't tour behind it, and I stayed in Los Angeles and did music for film and television, wrote songs and co-write and kept busy with different projects that would keep me home. I basically became Mr Mom. "When we resumed the Eagles, in 1994, and went back out on the road, my kids were actually old enough to come out and see what I did. They got a lot of appreciation for the music that I had been a part of and the scale of what was happening, and I got to celebrate that occasion with them. "That ended in 2001, and in the same 12 months after I left the Eagles, I ended up having a shocking divorce from my wife. I really lost every bit of identity that I had. The image of rock 'n' roll musician was gone; my career was taken away; my friends, or at least those people I thought were my friends, and the band were gone; and my image as a father and a husband - it was all taken away. I was at a place where I really had to figure out what had happened to me in my life to get me to this place in the world. "So I started doing some meditation, about 30 minutes to an hour a day, looking back into my childhood, experiences that I had in my life and how I had gotten to where I was in 2001. As a result of coming out of those meditations, I would write ideas down, recollections and periods of my life that I remembered vividly. Finally, I wound up writing and publishing a book called Heaven & Hell: My Life In The Eagles. But it didn't start out to be a book; it started out as a sintering of myself, an understanding of where I was and how I'd gotten there. "So I started putting together a band, and I wrote and went into the studio to work on this project. A lot of the songs that are on this record came from the revelations of things that had happened to me in my life and those emotions and feelings that went along with it. As records go, it's a little bit of an autobiography." How hard was it for you to find your footing musically after leaving the Eagles? Was there a period where you wondered what you had to offer on your own? "Yes and no. I mean, you say the name 'Eagles,' and everybody identifies with that. Even though I was a really critical and crucial contributor to that effort, individually there's a few names that pop up. People know Don Henley, they kinda know Glenn Frey, and some people know Joe Walsh from the solo career. Beyond that, very few people know Randy Meisner or Bernie Leadon. Some of the guys might know Timothy Schmit because he's still in the band. And then there's me. "But individually, none of the people in the band has had the kind of success of the Eagles as a total. I had some concern about stepping out as a solo artist, but I didn't really care so much about that, and I didn't care about the money and the fame and all that. I cared more about the joy that I got out of playing and writing music. That's what I needed to do for myself. It's what I started doing when I was 10, and it's what got me through the streets of New York when I was starving to death and all the other things I've been through. I just love to play. Other than my children and the people I love in my life, there's music." Because it's been so long since solo releases, was the recording a protracted affair, or once you started, did you do it fairly quickly? "I've had a studio in my home for some time. First it was analog, and then I went to Pro Tools. I've always worked on writing, whether for film or television or just my own songwriting, kind of continually. The whole process I was going through in 2001, all of those separations and loss of loves and friendships, really drove me to write songs, not with the idea of putting out a record but writing to express my emotions through music. "So I started writing songs like Over You with an acoustic guitar, me playing and singing it, just to get that expression and feeling out. The song Road To Forever, which I had started writing when my father passed away in the late '70s, I did it on acoustic guitar. But it was never big enough and strong enough, so I took that idea and redid an arrangement of it in the studio, just by myself, and I took it to where it should be. "I brought all the songs to the point where I had really finished demos with lyrics, vocals, harmonies, guitar solos, before I took them into a studio to record with other players. I had about 12 or 14 songs, and I had my band, my show band, learn them, and we went into a studio and just played them. I wanted to see how they translated from just me playing them to how a band would play them. I was very inspired by it all, although those recordings were never intended to be the final masters - I knew that wasn't the way to go about it. "I spent just about a year in the studio because I had a really busy touring schedule. Whenever I was in town, instead of having two weeks off, I'd be in the studio. When I was flying in a plane going to a show, I'd have headphones on, sitting with a computer and listening to the tracks. Between touring and my time in the studio, it was about a year to get the record done." You undoubtedly have a bevy of guitars, but for the record, did you rely on just a select few? "I have just a little under 300 guitars, all the way back to the ones I had in high school - I never sold them or traded them. With the exception of a few that have been stolen, I have just about every guitar that I ever bought. Each one has its own character and sound and feel and voice, and you have to make sure that each guitar has its own space on a record, or else it turns to mud. "For each track that we put together, I'd select three or four guitars that had different qualities, and different amps, as well. I'd say I frequently used my original '59 Les Paul sunburst that I recorded Hotel California with. It's got a special sound, it's really identifiable, and I put that through a little Tweed '50s Deluxe amp. "I used some old Fender Strats - a '56 and a '57. I've got a couple of Zemaitis guitars, so I used those, plus a couple of Teles and some Gibson SGs. I've got some Taylor acoustics, Martin 12-strings... There were a good variety of guitars that allowed me to place different sounds on the same song. I played every guitar on every song on the record except for the one that Steve Lukather did on Road To Forever. I wanted to do a little dual at the ending there, on a couple of harmony parts, and Steve was my first choice for that." I love your slide playing on Fall From The Grace Of Love. Who were the slide players that influenced you? "Well, I grew up in Gainesville, Florida, and there was an unusual number of unique talents that grew up there. Stephen Stills and I had a band together when we were 14, 15 years old. Tommy Petty is a few years younger than me - he was one of my guitar students. Duane and Gregg Allman lived in Daytona, but they would come to Gainesville and play in all the battle of the bands against us. They did all the fraternities and parties at the University of Florida. "I first encountered electric slide guitar from Duane Allman. I became very good friends with him; in fact, I sat on the floor of his mother's house in Daytona, and he showed me how to play slide guitar, the tunings and positions. I never wanted to emulate and copy Duane, but I learned my foundation from him. He was brilliant, of course. I stole everything I could from him - and Petty stole everything he could from me! [laughs] That little area in Gainesville was something. If somebody knew how to do something and the other guy didn't, we shared it. And we all wound up going on to be multi-platinum-selling, Rock And Roll Hall Of Fame artists. It was definitely a little hotbed of creativity."